The price of bitcoin broke through US$4,000 per coin on Sunday and is still above the symbolic level in early trade on Monday. Bitcoin crossed the US$4,000 mark at close to 1:00 am on Sunday and stands at US$4,056.80 at the time of writing (2.10 am EDT). Iqbal V. Gandham, UK MD of trading platform eToro, said in an emailed statement: “Bitcoin hitting US$4,000 is another milestone in long list of big moments the cryptocurrency has witnessed in recent weeks. Following a fall to US$1,800, it has come back strongly and relatively steadily. This is encouraging. Bitcoin has been on an incredible rally this year, up over 300 percent since the start of the year. The digital currency only passed US$3,500 for the first time earlier this month. Elsewhere in the cryptocurrency space, Bitcoin Cash, the new cryptocurrency that was split off from bitcoin at the start of the month, is also rallying strongly. 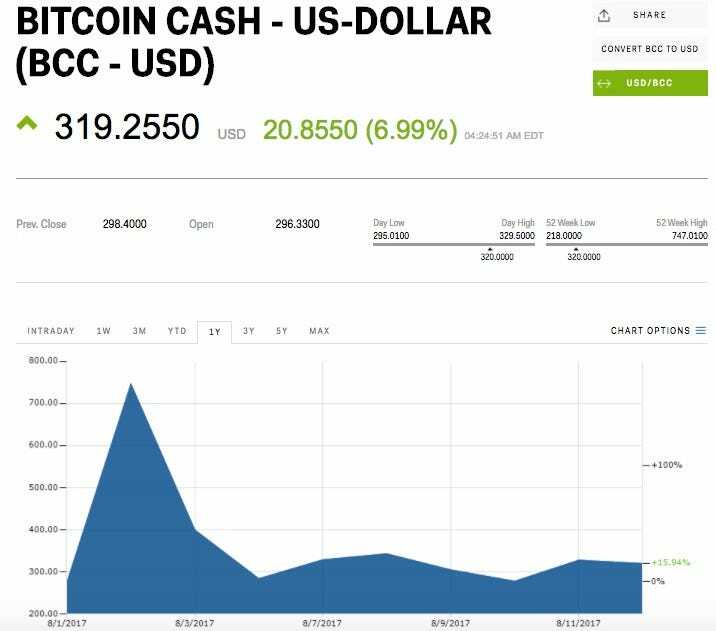 Bitcoin Cash is up 6.99 percent to US$319.25. Ethereum, the other major cryptocurrency, is rallying too. The digital currency is up 7.45 percent to US$319.76 on Monday morning in London.